CKY have announced a UK tour for later this year. They made the surprise announcement on Facebook, releasing a poster featuring all 12 dates. They’ll kick off the run of shows at Brighton’s Concorde 2 on May 8 and wrap up with a performance at London’s Underworld on May 21. 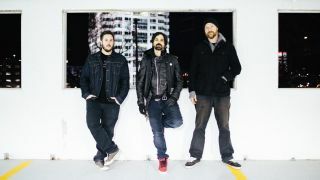 CKY have released four studio albums – their last being 2009’s Carver City, which was recorded with former vocalist and co-founding member Deron Miller. The lineup currently consists of Jess Margera, Chad I Ginsburg and Matt Deis. CKY are working on what will be their fifth album. Last year, the band posted several pictures from the studio on Facebook – and the trio will premiere several of the new tracks on the UK tour. Tickets for the UK shows will go on sale from February 24 (Friday). Metal Hammer is back! And we've got M Shadows interviewing Ozzy Osbourne!